This small hot-dipped 2.25 gallon galvanized tub is no less rugged that its larger counterparts. It is still built with our three key features for durability: a reinforced rim, body swedges, and an offset bottom. Additionally, it is corrosion-resistant and watertight. They are the perfect size for creating an herb garden for your kitchen. All you need is two stacked tubs and a way to punch drainage holes! These planters can even be hung in your window to provide a functional decoration. 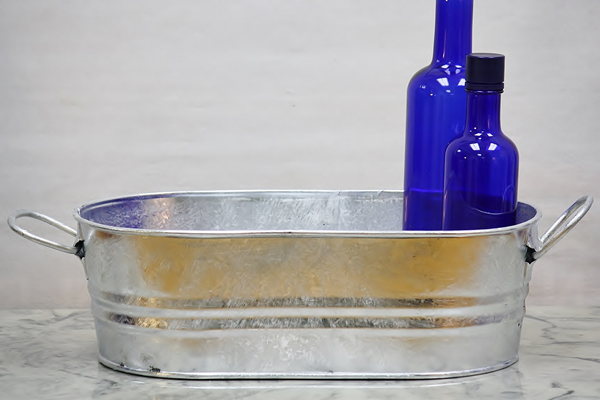 Serve up to 15 standard beverages on ice in this galvanized metal tub. Note: This item's rough finish may result in sharp edges. We also offer a 3.7 gallon galvanized tub if you are looking for something larger.